Ms. Magazine is honored for 40 years of the women's magazine in an anniversary celebration at New York City Hall. 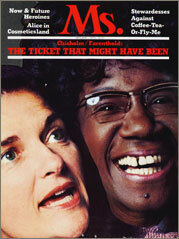 Shirley Chisholm was on one of their famous covers. The January 1973 issue reflected on the impact of Chisholm's historic presidential run. Read the original article here.